How we prepare dream girl hair extensions? Ever wondered how your hair extensions are made? If you wear or stock 100% human hair extensions then a lot of work goes in to making sure they are cleaned and styled properly. Dream Girl prides itself, as one of the premier hair extensions brands in Europe, on making sure all its products are sourced ethically. At every stage of the process as they work their way to the shelf, and ultimately your head, we take great care to every one of our Hair Extensions is treated delicately and safely. So here is the process of how it works, from their source to you. The first stage is the disinfectant and dyeing process. There are hair markets who sell raw human hair fibres. Each batch is sold by weight. Dream Girl works with only ethical suppliers who can prove their trade lines. The hair we receive is already washed and cleaned. Even though the hair is cleaned, Dream Girl adds a processing stage. Like a deep cleanse we treat the hair to remove any potentially harmful bacteria. It is like a disinfectant that uses very hot steam along with a treatment to kill any bacteria. This process takes two hours. The products used are then washed off so there is no evidence of them by the time they get to you. 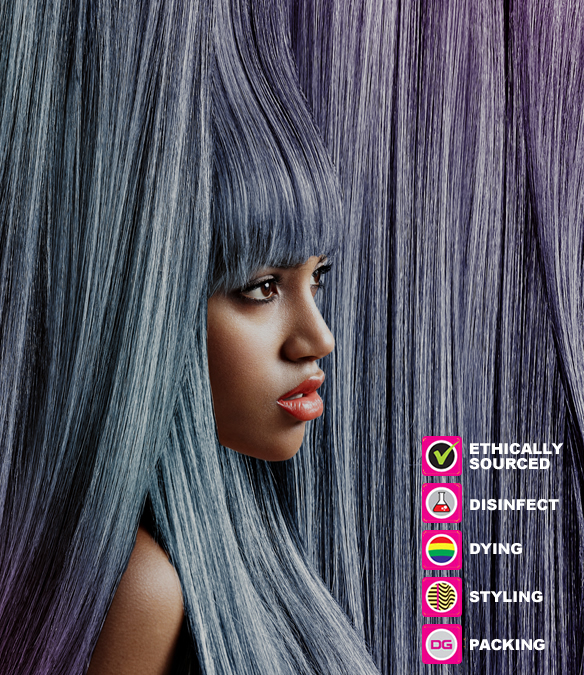 Once the hair is fully cleansed it is sorted into lengths and then bleached and coloured to achieve the right shade. To offer a range like Dream Girl that comes in over 80 different colours from Snow White to Burgundy hair needs to be coloured. We use regular hydrogen peroxide based dyes. It takes between one and three hours to dye hair to the right colour. It depends how rich the shade needs to be. The hair is then thoroughly rinsed and then it is time for styling. Whether waves or curls once the hair is styled it then needs to be dried. We use what are like hot ovens to dry the hair completely before it is styled. This takes around two to three hours. The Hair Extensions are now finished. They are sent to the packaging department who put them into the parcels and packaging that you receive them in when you buy Dream Girl Hair Extensions. At Dream Girl® hair extensions, we are committed to providing you with hair that has been ethically sourced and can confidently guarantee its quality and origin. All the Hair Sourced is from South East Asia and is sent to China for deep cleansing, processing and final production. We maintain exceptionally high standards of production and specify strict guidelines that hair suppliers have to follow to ensure that the best quality hair possible is sourced and delivered to your salons and we are continually monitoring their business practices to ensure that no exploitation or unethical practices are committed. Dream Girl only work with supply sources that meet our ethical policy standards and actively seek to work with and support those that promote responsible business practices. We actively engage with organizations that offer conditions of employment that are fair to all their employees and compliant with local health and safety regulations as well as other standard employment conventions. The Standards contain various internationally respected labour standards primarily based on e.g.ILO Conventions, including the so-called core conventions, the UN's Universal Declaration on Human Rights, the UN Convention on the Rights of the Child, Rights at Work, Fair Wear Foundation, Fair Labor Organization, UN Global Compact, OECD guidelines for multinational enterprises and various other leading and well-respected conduct-guideline initiatives. We actively seek to work with organizations that source raw materials ethically from quality controlled, reputable suppliers and conduct fair business with dignity, honest and responsibility in all aspects of their business. Dream Girl® hair extensions will continue to ensure that salons and customers receive the highest quality human hair available, while maintaining a professional, ethical and responsible manner that extends to through the supply chain.